Now that might have something to do with the Blarney Stone, the legendary Stone of Eloquence, found at the top of our Tower. Kiss it and you’ll never again be lost for words. But don’t take our word for it – everyone from Sir Walter Scott to a host of American presidents, world leaders, and international entertainers has been eager to take advantage. The castle was eventually invested by Cromwell’s General, Lord Broghill, who, planting a gun on Card Hill opposite and above the lake below the present mansion or new castle, succeeded in breaking the tower walls. However, when his men entered the keep, he found two old retainers, the main garrison had fled by the underground caves situated below the battlements known as the Badgers Caves. There are three passages, one to Cork, one to the lake and one seemingly to Kerry. At any rate, all had gone together with the reputed gold plate. Blarney House, situated just 200 yards south of the great castle itself, is Blarney’s newest treasure. It is one of the most elegant and gracious of the Great Houses of Ireland. A family home now tastefully restored to its former glory. 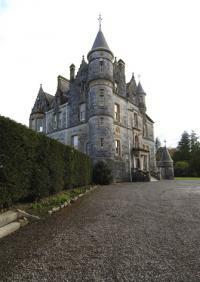 Built in 1874 it is beautifully situated overlooking Blarney Lake. It contains a fine collection of early furniture, family portraits, tapestries and works of art. There are conducted tours of the house which is open during the Summer season. Please check our Visitor Info page for more details about our opening times. The beautifully maintained gardens of lawns, shrubs, flower beds and trees gently slope towards the lake, providing a perfect setting for this gracious house. A herd of cattle browse peacefully beneath ancient lime, oak, beech and gnarled walnut trees. There are numerous woodland walks on the grounds of the Blarney Castle estate, through which winds the River Martin. In the arboretum you will find colorful displays of copper beech, ornamental pear, southern beech, nothofagus and evergreen oaks. Adjacent to the arboretum, one finds the Belgian Beds planted with hybrid azaleas, and a western red cedar tree from British Columbia. 5 miles from Cork City, 25 mins from Cork airport. 50 minutes from Ringaskiddy Port and Brittany Ferries from Roskoff. 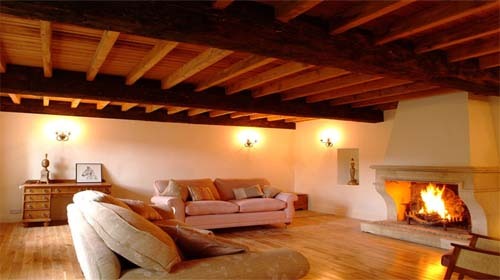 A very spacious converted stone built barn. 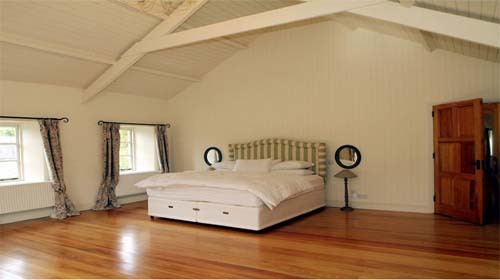 * One Master bedroom with ensuite, bathroom/shower room and dressing room with spectacular views of lush green grass fields. * One twin bedded bedroom with bathroom. * An enormous bedroom with two beds. * One self contained bedroom with shower room and own entrance corridor. 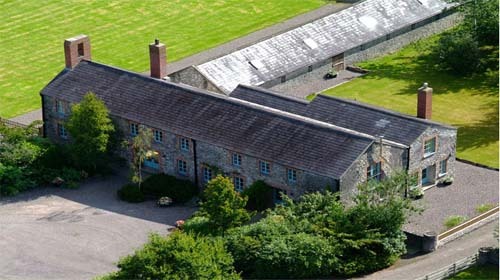 The barn is located within the private gates of the world renowned Blarney Castle and is accessed down a private drive of over 1 mile long. The estate grounds are magnificent which includes the magical Rock Close. Blarney village is a busy village with several restaurants and pubs set around a village square. In fact, it is one of the last remaining estate villages to remain intact. It is in easy distance of Cork City and other beautiful locations such as Kinsale & Cobh and also near the beautiful coastline and peninsulas of West Cork and Kerry. There are numerous golf courses, equestrian facilities and fishing in the area. * The huge Kitchen has 2 cookers, including a 2 door Aga. * Dishwasher, American style Fridge/freezer with chilled water and ice machine. * I-pod player in the kitchen. * There are French doors leading from the kitchen onto the terrace. * The utility room has a large fireplace suitable for logs that the estate can provide, if required. There is a sony flat screen TV in this room. * The sitting room has a log burner in it. It is oil centrally heated and has been equipped to the highest standard with high quality, new beds. * The kitchen is fully equipped and the linen, towelling etc is provided. * The garden is entirely private and beautifully maintained by the gardeners of Blarney Castle.